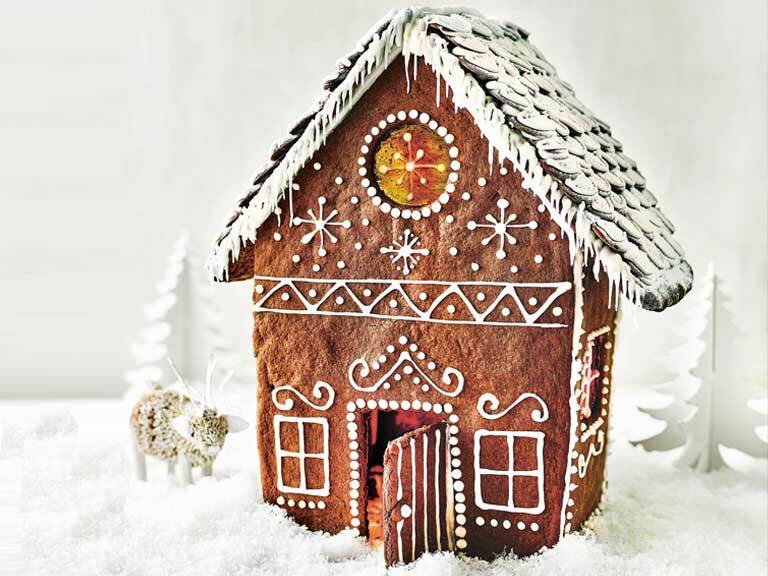 GBBO judge Paul Hollywood shares his recipe for a traditional Christmas gingerbread house, ideal for baking with grandchildren. Every Christmas we go away to France for a family holiday and do a chalet baking competition with other families. Each team gets a gingerbread house to decorate in an hour and I’m the judge, of course! The house will last about a week or so, over Christmas. You find the roof tiles – chocolate buttons or Smarties – tend to get eaten first; then the Flake chimney goes, and then people start snapping bits and pieces off all over the place. Start by cutting out the templates for your gingerbread house. You will need to make three paper or card templates: a rectangular side wall (18 x 10cm); a rectangular roof (19 x 12cm); and a main wall with a triangular gable top (base 18cm, sides 18cm and then sloping into a triangular gable 29cm from base to apex). You will use these to make two side walls, two roof pieces, a front wall and a back wall. To make the dough, in a large bowl, mix the flour, bicarbonate of soda and spices together. Add the butter and rub in with your fingertips until the mixture resembles fine breadcrumbs, then stir in the sugar. In another large bowl, mix the eggs with the golden syrup and treacle. Add the flour mixture and mix to combine and form a soft dough. Transfer the dough to a lightly floured work surface and knead until smooth. Wrap in cling film and refrigerate for at least 1 hour. Heat your oven to 180°C/Gas 4 and line four baking trays with baking parchment. Lift the pieces onto the prepared baking trays, placing the front and side walls on two trays, and the roof pieces, back wall and cut-out door on the other two trays. Bake for 8 minutes, then take out the trays containing the front and side walls. Trim the windows with a knife, or use a cutter, to remove the dough that has spread, then fill with crushed sweets. Return to the oven for 7 minutes until the sweets have melted to resemble coloured glass and the gingerbread is firm. Remove the trays containing the roof pieces, back wall and door after they’ve been in the oven for 15 minutes, or when they are firm. Leave the pieces of gingerbread to cool on the baking trays for 5–10 minutes to firm up, then transfer to wire racks to cool completely. Mix 250g of the royal icing sugar with 3 tbsp water to make a thick pipeable icing and put into a piping bag fitted with a writing nozzle. Pipe the decoration of your choice onto the walls. Pipe parallel lines of icing on the roof and stick on the chocolate buttons, overlapping them slightly to resemble tiles. You can also pipe semi-circles of icing on each button for extra ‘snow’. Leave the walls and roof to set for at least 10 hours, or overnight. To assemble the house, have your cake board ready. Heat the apricot jam with a little water, then brush over the cake board. Cover with the desiccated coconut so it looks like snow. Mix the remaining royal icing sugar and water to a thick paste. Pipe icing on the base and sides of the front wall. Use a mug as a prop and stand the front wall against it so that it remains upright and sticks to the cake board. Pipe icing along the sides and base of the other three walls. Place them firmly on the cake board and join the edges together to make a house, using more icing as needed to fill any gaps. As you go, use icing to stick 3 Flakes on the inside base of the house, against each wall (except the front wall with the door); also stick 4 Flakes upright on the corners to act as supports. Attach the front door with icing. Leave to set for at least 10 hours or overnight before attaching the roof, storing the spare icing in an airtight container. You can attach both roof pieces at once but it is easier to do this in two stages, leaving time for setting in between. Pipe a generous amount of icing on the top edge of one side wall and the front and back gable on the same side of the house. Use icing to attach a Flake to the top inside of that side wall to act as a support. Pipe icing on the edge of one roof piece and attach it to the house. Use a large glass (such as a pint glass) to prop it up until the icing sets. Leave to set for at least 5 hours, ideally overnight; store the spare icing in an airtight container. Attach the other roof piece in the same way and leave to set. To finish, pipe icicles along the roof edges, using more icing, if you like. 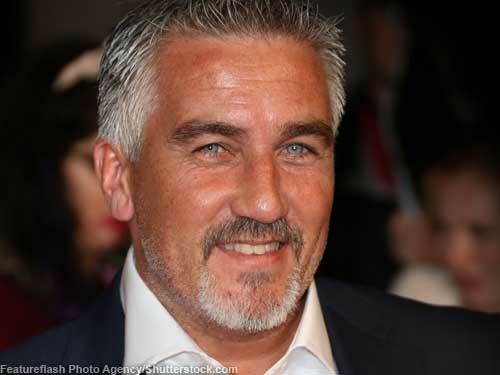 Paul Hollywood is best known for being a judge on The Great British Bake Off.